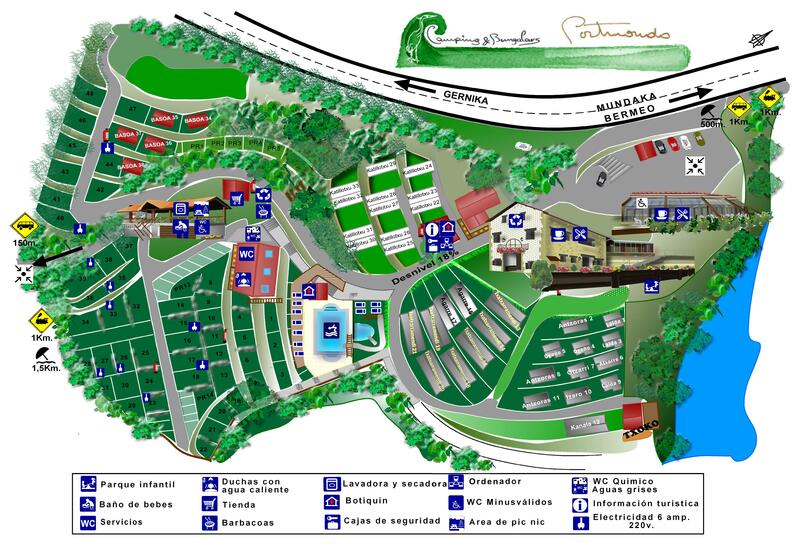 The Portuondo campsite is located in Mundaka, a municipality in the district of Biscay known as Urdaibai. This area of outstanding natural beauty brings together a combination of beaches, mountains, culture and great fun with a rich natural environment, declared a UNESCO Biosphere reserve in 1984, making it one of the most emblematic tourist enclaves in the Basque Country. Follow the BI 2235 Amorebieta-Bermeo district road, drive through Gernika and follow signposts towards Bermeo. If you’re coming from Bermeo, take the Mundaka road and follow the signposts. Exit 97 if you come from San Sebastian, exit 100 if you come from Bilbao, of the AP8 motorway. Follow signposts towards Gernika and then towards Bermeo. Loiu (Bilbao) is located 30 km from the campsite. (Airport-Bilbao bus line: Compañía Bizkaibus, line A3247. In Bilbao, get off at Plaza Moyua). Compañía Bizkaibus, line: A3515. Bus stop next to the camp site with buses going to the centre of Bilbao and Bermeo every half hour. In Bilbao, the bus stops at Hurtado de Amézaga, next to Abando station. Railway station ¾ mile from the campsite in Mundaka. Bilbao-Bermeo line with trains every half hour. Connections onto the Bilbao metro and with all Bilbao public transport.